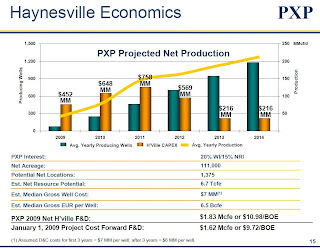 Haynesville Play: The Haynesville Shale Resource: Plains Exploration: Hey Big Spender! Around the Haynesville Shale, Plains Exploration is best known as Chesapeake Energy's sugar daddy. A joint venture arrangement has Plains paying a large portion of the development costs for wells on Chesapeake's property. It's certainly not a one-way deal. Plains bought into one of the largest leaseholds in the market that was ready to be drilled. The deal combined Chesapeake's technical abilities and tenacity with Plains' muscle to create a formidable venture. 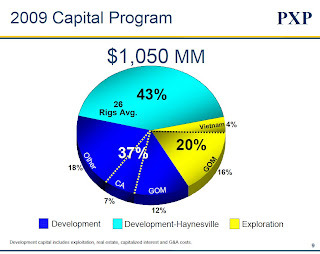 Plains' muscle is no better displayed than in its capital budget for the Haynesville Play. 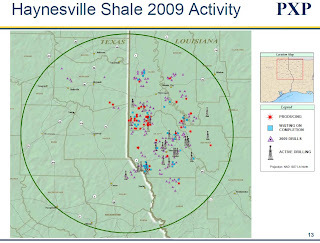 Its 2009 Haynesville budget is $452 million, which represents 43% of Plains' capital budget. The map below shows where the action is. The company had a flurry of drilling activity around the DeSoto/Caddo Parish line a few months back that is either producing or awaiting completion. Plains' 26 drilling wells mostly have relocated to southern DeSoto, operating on a near 45 degree line stretching from Shelby Co., TX to western Bienville Parish, LA. These guys have clearly been busy beavers. 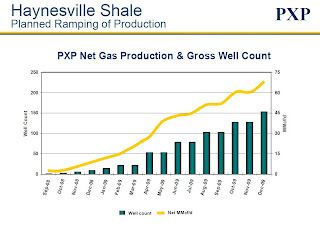 The chart below shows the expected ramp in the number of wells and production by the end of 2009, when Plains expects to have drilled more than 150 wells with estimated production of approximately 70 MMcf per day. The chart below is particularly interesting because it shows projections for capex, number of wells and production for the next five years. Plains expects to have nearly 1,200 wells producing more than 200 net MMcf per day of gas by the end of 2014. Keep in mind that the production numbers are net, and Plains owns a 20% working interest in the project, so the table implies more than 1 Bcf/day from these wells by 2014. Over six years, including 2009, Plains expects to spend $2.9 billion in capital on the Haynesville Shale. In terms of well economics, Plains is assuming a 6.5 Bcfe estimated ultimate reserves (EUR) and a $7 million well cost.